Bullish Scott Brown dismissed any notion that Scotland’s players may be daunted by superstar striker Robert Lewandowski in tonight’s critical Euro 2016 qualifier against Poland. The free-scoring forward’s name has dominated the agenda ahead of a match which the Scots are treating as a must-win encounter as they bid to breathe new life into their faltering bid to make it to next summer’s finals in France. A run of 12 goals in his last four games, bringing his tally for the season to 19, prompted Scotland manager Gordon Strachan last night to bill the Bayern Munich hitman as the best player in the world over the past month. However, Brown, part of a team that nullified Lewandowski in a 2-2 draw in Warsaw a year ago, was in no mood for such cooing over world football’s man of the moment. He believes that Scotland’s team ethic can trump individual quality when it really matters at a packed Hampden. “It is not about one guy, it is a team game,” said the Scotland captain. “That is where we come to our strength. We are strong as a team, we work hard off the ball and on the ball and we believe in each other. Hopefully, Poland rely too much on one player. Lewandowski has reiterated his complaints this week about what he felt was rough-house treatment from the Scots in that aforementioned match in Poland last year. The striker was particularly irked by a challenge from Brighton defender Gordon Greer, and the Polish camp have pleading for protection for their players from the officials tonight. Despite his gripes, the striker completed the match and played for his club the following weekend. Brown insists there will be no treading on eggshells from the Scotland players in response to Lewandowski’s claims. “It was a great tackle by Gordon Greer,” he said. “It’s just the kind of thing good defenders do. He won the ball and he can’t stop his body following through. It was natural but, if there’s a ball there to be won, a 50-50, then I’m sure he would do the same again. Scotland, currently fourth in Group D, know a win – coupled with victory in Gibraltar on Sunday – is likely to be required if they are to have a realistic chance of forcing their way into a play-off. Their whole campaign has effectively boiled down to what happens tonight although Brown says he would have settled for this scenario when his team was first pitted in a group alongside Germany, Poland, Ireland, Georgia and Gibraltar. “It was always going to be a hard group, especially when you see the world champions, and you think they are going to win every game,” he said. “They had a slow start but they kicked on towards the end and we all knew Poland were a good team and Martin O’Neill with Ireland was always going to be a battle and a hard game. We have come through that and it is coming down to the game against Poland now that we need to show how good we are. We need every single fan in that stadium to help us out because we need everything for this last push. “It is a huge game for us. Every game in this campaign is huge but we need to get something here. “We can’t have any regrets tonight. This is the big push and we need to make sure we give one hundred per cent. Every single player in our team, the subs who come on, everyone in the background too. We all need to be at our best. 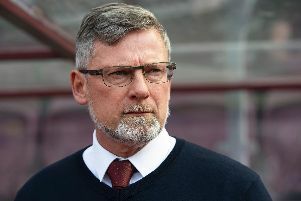 Strachan’s future is becoming the subject of some uncertainty, with the manager’s contract due to expire at the end of the campaign. Brown, however, hopes his services are retained regardless of whether or not qualification for next year’s finals is achieved. “He’s taken us forward. He’s made football entertaining for the nation to watch. We’ve had great performances over in Germany and over in Poland. No other managers would have wanted us to play the way we did in those games. He’s believes in himself and his style of play and that makes him the character he is. I think he loves it here and enjoys it. The way he comes onto the field every day you can tell he loves being around the lads.